For the fourth year running, The Prince of Arcade is filling the Eastern Bloc New Media Center with a host of unique and unreleased games from independent designers. From wildly competitive digital showdowns to machine-mediated meditation, the games appeal to both player and spectator alike in a dynamic reconfiguration of the art gallery. Come on out for a night of drinks and electronic fever-dreams! LE PRINCE EST DE RETOUR! Pour une quatrième année consécutive, la soirée Prince of Arcade remplit le centre de nouveaux médias Eastern Bloc avec une foule de jeux par des créatrices/créateurs indépendants. Comprenant des jeux compétitifs déchaînés côte à côte à des méditations numériques, les installations font appel aux joueurs comme aux spectateurs dans une reconfiguration dynamique de la galerie d’art. Soyez des nôtres pour une soirée de drinks et de transcendance numérique multi-joueurs! We’re doing stuff over the next two weeks! 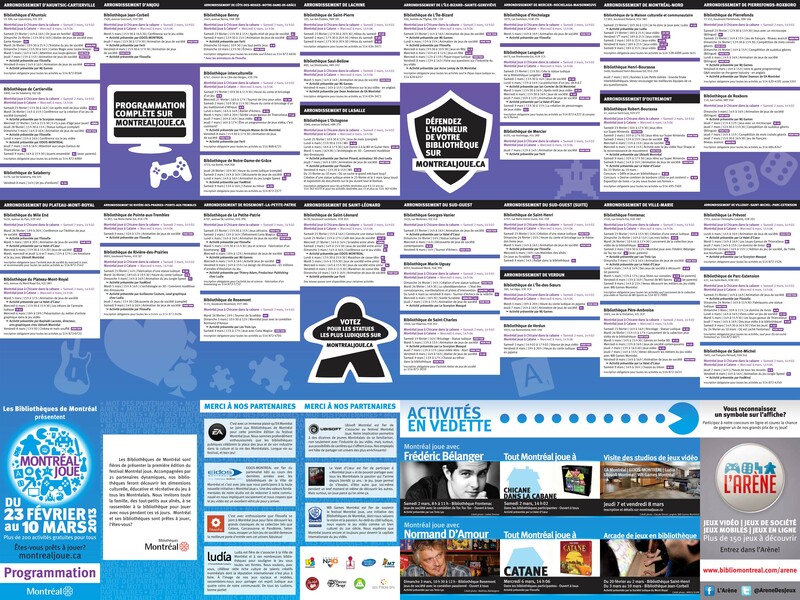 Montreal’s Libraries are organizing a huge festival titled Montreal Joue from February 23 – March 10, and we are proudly bustling around the Arcade Royale between libraries. Also! MRGS will once again be participating in the SAT’s Nuit Blanche festivities on March 2nd, 2013. The Royale will be present, and our friends from Toy Company will be there tearing it up in the SATosphere (which if you’ve never been in, is incredible). There may even be more to announce in terms of programming in the near future, stay tuned. The invitations have been sent, the gallery has been prepared, and the punch has been spiked. The Prince of Arcade awaits…but Where? And When? And Price and Facebook event?! As if there weren’t enough incredible games in the lineup, analysts are now predicting that this year’s Prince of Arcade will feature the public unveiling of the latest iteration of the Arcade Royale — a home-grown, hand-crafted beauty of an arcade cabinet. Featuring exclusives from the Montreal indie game dev community — as well as a special guest or two — the arcade is a fusion of old-school aesthetics and exciting new gameplay. The Royale beckons! Will you answer?